The past week has been a tough one for Teddy and for Jill. When Teddy first came home from the hospital, he seemed to be adjusting quickly. He’s always been an independent boy and so he has rejected any support such as a strap or harness when taken out for toileting. However, this week, Teddy became noticeably withdrawn. For much of the time, he was restless and would whimper frequently. We were sure he was in pain. Because he was so out of sorts, we also felt that he was suffering from anxiety. When I saw Teddy on Monday, Jill was stressed and Teddy was clearly not himself. We introduced a hot water bottle (or ‘hottie’ as they are known here) on his back which seemed to provide relief and comfort. I also gave Jill a CD from the Through a Dog’s Ear range. This music is designed specifically for dogs to help calm and treat anxiety. These seemed to assist Teddy in the short term to relax and rest. We seemed to agree on Monday that he was taken off his pain medication too quickly – he was taking only Previcox at the time – and his body had been left vulnerable. A Fentanyl patch was re-introduced on Monday and replaced again on Thursday. Jill also started Teddy on Tramadol on Thursday and Teddy received a ketamine injection, too. Meanwhile, I could tell that Teddy’s back muscles were stiff; his top line did not seem normal, and he was clearly distressed at being handled along the withers and the back. Thankfully, since Teddy was too uncomfortable for deep massage, I was able to use the low level laser along his spine and muscles to help with blood flow and pain relief. I know I want to passively stretch Teddy’s spine but we agreed to wait until Teddy was more comfortable before attempting this. I was able to do passive range of motion stretching on Teddy’s legs. Armed with this information Jill took Teddy for acupuncture on Tuesday and an osteopathic adjustment on Friday. Both his acupuncture vet and his osteopath agreed that Teddy was in pain and that support with traditional veterinary medicines were needed. The osteopath used gentle traction on Teddy’s back since she found his spine has become compressed. With his pain properly managed, we can do more to help Teddy’s muscles, tendons and ligaments to adjust to his new gait. And then true rehabilitation and exercise can begin including a greater focus on core muscle strength. 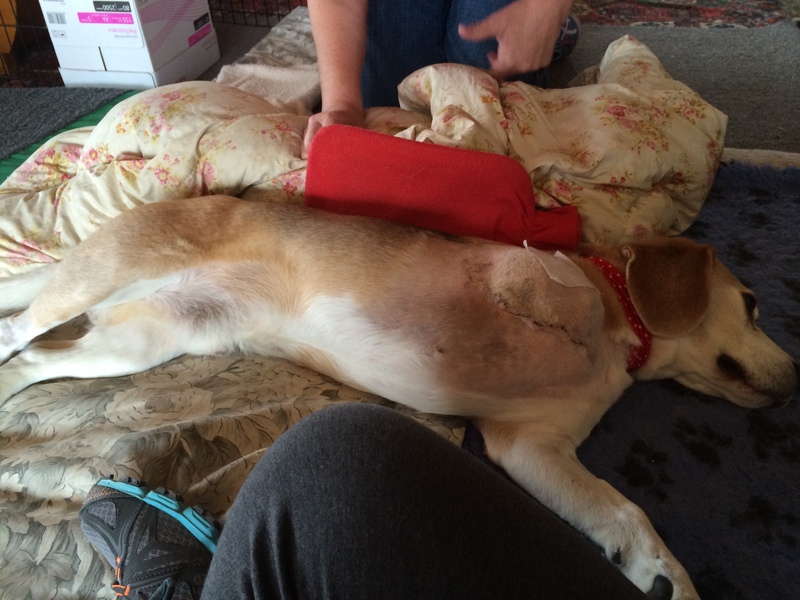 During this stressful week, Jill took to the Internet for help with Teddy’s condition. 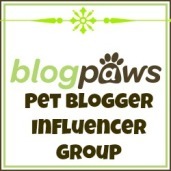 She found a wonderful site – Tripawds Blogs – for owners of amputee dogs. Owners soon responded with news that helped to assure Jill she had made the right decision for Teddy and gave her information to help her discuss pain management with her vet. Jill says, “In hindsight, we really took things too quickly and allowed Teddy to move around the garden area with enthusiasm. I wish I had thought of this sooner and we may have avoided him seizing up so badly. The Tripawds site has been a fabulous resource for me knowing that there are others who have been through this before us. It’s a new week – and we are all hopeful that Teddy is back on track to recovery. He’s booked for massage and acupuncture this week. This entry was posted in Teddy's journey post-amputation and tagged acupuncture, anxiety, fentanyl, hot water bottle, laser, massage, osteopathy, pain, pain management, pain relief, Teddy, tramadol, tripawds, tripaws, tripod. Bookmark the permalink.